The history, natural beauty and intrigue of the Arabian Peninsula is embodied in the modern marvel of Dubai. 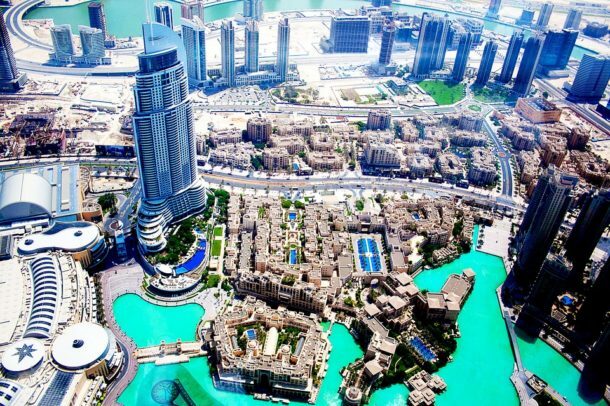 The second largest city by population in the United Arab Emirates, Dubai is recognized by dignitaries, royalty and celebrities from around the world as a premier travel destination. A wedding in Dubai is something truly special. Centrally located between Europe, Asia and Africa, with a wide range of international flights daily, Dubai is convenient for wedding guests from around the world. Residents of Dubai are primarily Muslim, so Dubai is an ideal location for an Islamic destination wedding, but if you are willing to legally marry at home, almost any couple can enjoy a symbolic marriage in one of the city’s many world-class hotels and resorts. Elegant ballrooms, quaint courtyards, and cozy resort villas are just some of the venue options for your wedding events. Other luxury wedding venues in Dubai include beachfront resorts, private villas and yachts. If your heart’s desire is an outdoor wedding, our local experts recommend the months between late October and May when the weather is the mildest. Winter is beach season in Dubai, perfect for a relaxed ceremony in the sand or a waterfront celebration. Host a variety of events for your guests during their stay, from a welcome reception overlooking the stunning city skyline, to a quiet spa brunch with your wedding party. Our wedding planners in Dubai will help you incorporate local flavors and entertainment into each of your events, and customize your menus, décor and activities to represent elements of your style, background and love story. Whether you want to enter your ceremony to the drums of a traditional Zaffah band or dance the night away with a live band or DJ, we can match you with the perfect artists to make your day extra special. Note that the majority of Dubai destination weddings happen in hotels and resorts due to strict alcohol regulations in the UAE. Legal and spiritual weddings are available only to those couples who meet the UAE’s religious and residency requirements. There are far fewer requirements for symbolic marriages. Our sensitive planning team is experienced at balancing these personal needs, and will be delighted to review your specific needs and help you customize a plan for the perfect destination wedding in Dubai. Your guests will enjoy access to world-class amenities and activities during their visit. Between events they can relax on the beach, participate in watersports like skiing, surfing and sailing, or explore the local culture through sightseeing or a food tour. The adventurous at heart might spend the day at one of the world’s finest water parks, or go for the ultimate Middle East experience on a 4×4 excursion to the desert for a camel ride or sandboarding. You can tour the city by foot, balloon or even helicopter. Your guests are sure to be intrigued when you announce that you are getting married in Dubai! Cocoon Events designs the bespoke weddings and exclusive parties of your dreams. Our professional team creates stunning multi-day events from scratch and helps you coordinate all aspects of your event, from the concept to entertainment, to logistics, hotel bookings, guest sevices and a lot more. We can start creating your unforgettable event today.